I know it’s not exactly transport-related, but it is pretty big news today that the future structure of the Auckland Super City has been released. Well, by that I mean the boundaries of the different wards have been released, as have the boundaries of the local boards, and how they will be comprised. The southern boundary of the region has also been finalised. At a basic level, the 20 councillors will be elected from 12 wards. Eight wards will have two councillors and four will have one councillor. The full report is available here, and the associated maps can be downloaded here. 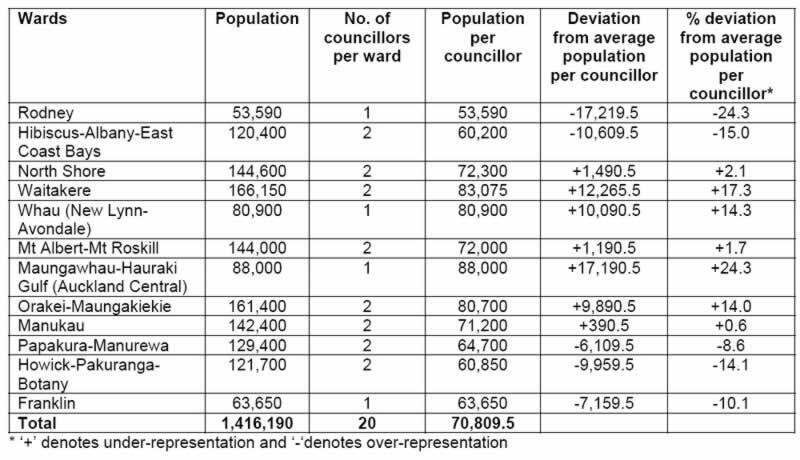 The population, names, number of councillors and so forth are included in a useful diagram below: Probably the most interesting column in this table is the one on the far right – which effectively shows the level of ‘unfairness’, or deviation from the idea of everyone having their votes count equally. Some level of discrepancy is to be expected, as the ward boundaries have been generally aligned with the local board boundaries – which need to take into account ‘communities of interest’. Plus the legislation required that Rodney and Franklin would have their own wards, with one councillor each. However, despite this, I really think there’s a problem here. Some discrepancy is not the 24% under-representation that we’ll get in the Mangawhau-Hauraki Ward (which just happens to be where I live, which probably explains part of my annoyance) or the 24% over-representation in Rodney District. This basically means that someone’s vote in Rodney counts almost the same as two votes in my ward. In terms of the local boards, things are a bit fairer. The Mangahwau-Hauraki ward gets split into three wards: one for the central area, one for Waiheke and one for Great Barrier Island. I guess the gulf islands are different enough to warrant a local board, but once again the central area seems particularly big to be one single local board. However, this is nothing compared to pretty much all of existing Waitakere City – which gets lumped into a single local board. One last thing that’s strange, is that the Central Auckland Local Board will be called Mangawhau. Mangawhau is the Maori name for Mt Eden, which is fine, but really the central part of Auckland isn’t Mt Eden. In fact, the suburb of Mt Eden is not even in the Mangawhau local board area, while the mountain itself is only just within the local board area. What’s wrong with “Central Auckland”? I have no problem with Maori names, but it just seems odd to name the area after Mt Eden when the suburb is outside the ward/local board area, and the mountain barely sneaks in. The mountain is only just within the area, and is hardly as much of a defining feature of central Auckland as is…. well, I dunno, the fact that it’s central Auckland. I made a submission (http://uroskin.blogspot.com/2009/10/submission-on-ward-representation.html) to the LGC to abolish the wards and have the whole city as one electorate with 20 seats to be alocated on a 5% of the vote basis (pure proportionality). They replied sniffily that the electoral system will be First-Past-The-Post, with all the attendant gerrymandering and distortions (for which the table is exhibit A). Seems the Tories want to keep cost what cost control of their prize. Uroskin, it seems that the Tories will get their gerrymandered city. And as a result we will have planning and control that favours developers and self-interested property owners in perpetuity. The assets will be privatised, Manukau and West Auckland will be neglected in favour of Remuera and the Shore, and Auckland will continue to be the city with “so much potential”. I thought that Hide and Key rejected the notion that the local boards consist of the current councils, as they would not be local enough. Seems that in the case of Waitakere, Franklin and Rodney the LGC disagrees. I’m sure the boards will consist of the same councillors that exist at present in those areas so it will be interesting to see how they pressure the Auckland council to regain some autonomy. I think that the local board boundaries definitely are assuming that the boards will be quite powerful. Interesting that the LGC went with only 19 boards. I find it interesting that those which are over-represented do appear to be what will end up being CitRat strongholds and those under-represented would vote otherwise. Yes there’s some pretty blatant gerrymandering going on. You forgot the 8 at large seats. I do agree about the unfairness of the proposed boundaries, but to ignore the at large seats in these calculations (including the mayor) is dishonest. What will be an interesting comparison is the proposed variations in population per ward with the ones for existing councils. There are no at large seats now Nicholas, except for the mayor. They got the boot from the plan during the select committee process, thankfully. That changes things. I actually think the at large seats could have been a good thing if the total number of seats was raised. We could have had MMP as an Auckland electoral system. I guess some debate is needed on the population varriance that should be allowed in local government districts. +-25% seems too high to me, but the need to retain existing comunities is still important. 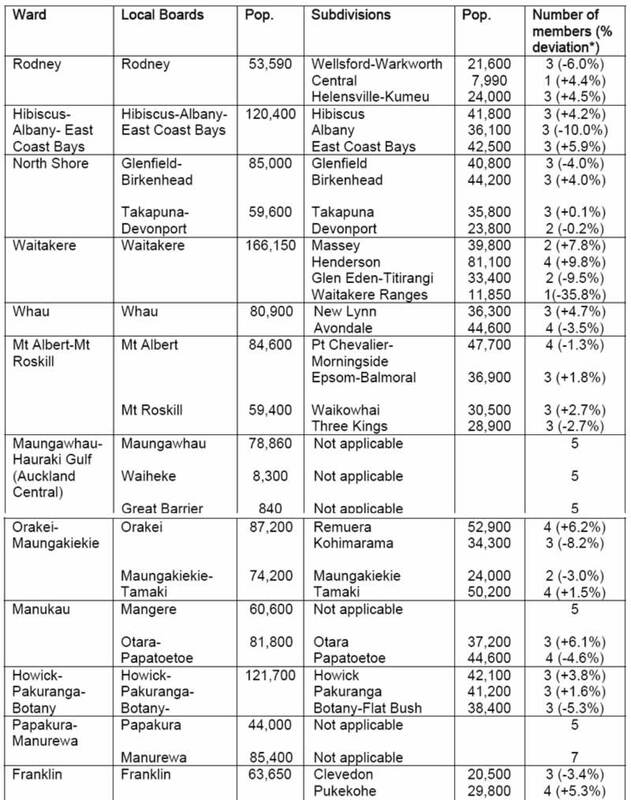 Interesting the maori seats option (if implemented) would have left maori grossly overepresented, and been the worst case of gerrymandering possible (especially as maori seats are deliberately intended to gerrymander in favour of maori candidates). Going on to public transport, the ward based system isn’t good for it, as no-one likes paying rates for a project that will not benefit their suburb. This means that all the councillors outside your ward, particularly those from wards with no rail lines, will have little incentive to back the CBD rail tunnel. This is quite worrying. Interesting thoughts about the at large seats. I think a lot of the worry about the at-large seats was due to them, historically, being captured by the Remuera crowd ( when Auckland City Council had them). I think that we are bound to see less parochialism for local areas than at the moment, due to having one council rather than 8. I think Auckland probably needs about 50 councillors, perhaps with 10 at large? My submission was for 3 three councillors for every national electorate seat plus 15% on top Maori seats… All up about 80 seats..! The LGC report doesn’t even mention Mount Eden – it has vanished. This is possibly to gloss over the fact that the proposed ward boundary splits it in half down Valley Road – the northern half (including Maungawhau) being sucked into the Central City where it does’t belong and the Southern Half suddenly becoming part of Mt Roskill. I think the commissioners have become very concerned about the number balance and have ignored communities of interest in these inner suburbs. As it stands our house on one side of Valley Road will be in a different ward to the local primary school (Mt Eden Normal). Mangawhau primary school of course is even further south. I would like to see the ward boundary moved north to the railway line/motorway – and change the name of the Central City to something else, and give the Maungawhau name to the ward to the south. I shall certainly be making a submission on this. Ian, you are not alone. Many of us in Grey Lynn feel exactly the same way. We will be making the same submission as you for the same reasons. I think that the central “Mangawhau” ward needs to be smaller, say around a population of 65,000, so that it is more equal on a per-capita basis with the other wards. The excuse given to over-representation in places like Howick/Botany/Pakuranga and Albany/East Coast Bays is that those areas are growing and over time they will become more “even”. The same argument could easily be applied to the central area – as its residential population is likely to grow significantly over the next 5-10 years. Yes, yes and yes. But where do we cut 23,000 residents from? I suggest Mt Eden, Eden Terrace, Epsom North, Remuera West and Newmarket for starters. But I don’t think that’d be anywhere near 23k.